“Seek the truth and report it” is a fundamental obligation of any journalist. While enshrined in journalistic ethics codes throughout the world, including the Society of Professional Journalists Code of Ethics, it did not begin there. The gathering and reporting of the news spans mankind’s history, as does the obligation for that news to be as accurate and objective as possible. Documentary filmmaking is a branch of journalism. At their essence both are—or should be—works of nonfiction. When a documentarian becomes so carried away with his message that he discards standard journalistic ethical obligations and distorts the truth in favor of forwarding his preconceived agenda, he ceases to be a journalist and becomes a propagandist. 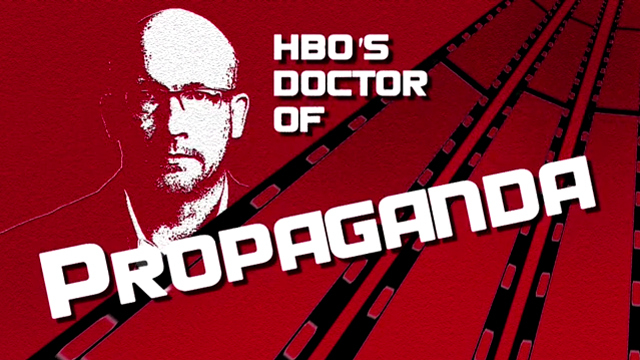 [Alex Gibney’s film] is a work of pure propaganda, designed to distort the truth, manipulate the viewer and incite hatred against Scientologists, their Church and their religion. Gibney and Wright take the book and ramp up the lies and drama a hundredfold, revising the fiction posing as “facts” laid out in the book to concoct an even more lurid, melodramatic and sensationalistic rendition for the TV audience. The result is the antithesis of a real documentary. Going Clear is a work of pure propaganda, designed to distort the truth, manipulate the viewer and incite hatred against Scientologists, their Church and their religion. Gibney intentionally misrepresents, distorts and ridicules the religion from the very first scene in the film. The opening scene and the first spoken words in the film, supposed to be depicting the start of an auditing session, completely misrepresent the subject, falsely presenting it as a sinister form of hypnotic mind control. Right from the outset, reality and the truth have been cast aside to further Gibney’s false narrative on the religion. Gibney continues throughout the film to falsely portray even the most basic concepts of the religion, providing a picture of Scientology so distorted, so warped and so wrong that the religion is rendered unrecognizable to the informed, and sinister and bizarre to the uninformed. These are the tried and untrue techniques of religious hate propaganda. Gibney’s hatred for the religion is palpable. To serve his real agenda in the film, Gibney and his collaborator Wright engage in propaganda techniques such as sleight of hand through outright falsehoods, blatant misinformation, omission of material facts, and conflation of time to attempt to manipulate public perception to view the Church’s well-earned attainment of IRS exemption in a false light. First, Wright falsely claims on camera that IRS exemption constituted the initial lynchpin decision that determined Scientology is a religion entitled to the protection religions receive pursuant to the First Amendment of the United States Constitution and international human rights law. Based on this utterly false premise, Wright the propagandist advocates revocation of IRS exemption to strip First Amendment protection from the Church. This is a complete invention by Gibney and Wright to serve their biased agenda to manipulate public support for the revocation of Church tax exemption. In the early 1990s, when the exemption proceedings commenced, Scientology had been recognized as a religion in countless U.S. Court decisions going back over two decades. The issue of Scientology religious bona fides had long been resolved. Lower courts throughout the United States, without exception and in numerous cases, had recognized the status of Scientology as a bona fide religion, and held that its practice must be protected under the First Amendment. Likewise, Scientology is recognized as a religion in many other countries around the world. The High Court decision was rendered a decade before IRS exemption. This is such a blatant lie and so far-fetched it is astounding. But then again, propaganda strategy holds that the bigger and more outrageous the lie the better. Wright’s pronouncement is nothing but pure bunkum. As detailed above, Courts routinely make determinations on whether a group or organization is a religion when First Amendment rights are at stake. The Church of Scientology had been recognized as a religion by the U.S. judiciary 25 years before IRS exemption proceedings commenced. Moreover, in addition to the IRS, many other federal and state agencies render rulings on the subject. Indeed, a number of federal agencies in the U.S. found that the Church of Scientology constituted a religion before the IRS did, including rulings by the State Department, the Immigration and Naturalization Service, and the Labor Department regarding Scientology ministers. Gibney and Wright used this straw man of IRS incompetence to render a religion ruling as an unsavory means to further the advocacy narrative they repeated time and again like good propagandists in their press rollout: IRS exemption should be revoked. There were barely five dozen pending FOIA cases in a handful of federal courts and roughly the same number of claims pending administratively when the 1993 exemption rulings were issued. Every other court case and administrative dispute that was settled in 1993 involved the various basic ways in which the IRS interfaces with any taxpayer—audits, summons enforcement, tax assessments, Tax Court cases to challenge tax deficiencies, and tax refund lawsuits—all of which were initiated by the decisions and actions of the IRS, not the Church or its parishioners. Gibney’s unsupported argument that the Church sued the most powerful agency in the country into submission is not only laughable, it also is a vicious and deliberate falsehood. Once the film aired, Gibney was not through. He lobbied for reopening of the exemption proceedings and continued to advocate on-camera and in print for exemption revocation—the actions of a propagandist, not a documentary filmmaker. Gibney and HBO stonewalled 14 requests by the Church to offer relevant information. In reality, Gibney never intended to give the Church a right to respond and set the record straight. Instead, Gibney and HBO stonewalled 14 requests by the Church to offer relevant information. More than 25 individuals with firsthand information flew cross-country to meet with Gibney, eager to speak with him. Gibney refused to meet with them. Worse, neither Gibney nor HBO ever answered the three dozen letters from the Church requesting an opportunity to respond and demanding correction of egregious factual errors in the film designed to twist the truth. As Gibney’s only interest was to obstruct the truth, the Church decided to do Gibney’s work for him. The results of the extensive research by the Church to document the truth Gibney ignored is evidenced at www.freedommag.org/going-clear, both as to the propaganda Gibney put forward and the discredited “sources” he relied on. This exposé contains 25 videos and 16 articles on Gibney and his sources, all with supporting documentation, as well as 30 letters the Church sent to Gibney and HBO, all of which document the fraud that Gibney perpetrated on his viewing public. The site also shows the truth about the Church of Scientology that Gibney chose to ignore. This material shows that the film is filled with provable lies. Case in point: Gibney selectively edited material he collected, altering the content to fit his false narrative. Gibney edited a CNN interview of the former wives of Mike Rinder and Tom DeVocht, omitting much of what they had to say and switching the sequence of the interviews to create a false impression of the witnesses’ truthfulness. Gibney exhumed a self-admitted perjurer dead nearly 20 years to put forward complete falsehoods that contradicted her contemporaneous statements 40 years earlier. Worse, Gibney concealed that she is deceased. Gibney then hired an actress to speak melodramatically from a script to deceive audiences into believing the deceased woman was voicing current allegations, rather than discredited allegations that she had recanted decades earlier, about Scientology Founder L. Ron Hubbard. Her statement at the time speaks for itself: “I do hereby state that the things I have said about L. Ron Hubbard in courts and the public prints have been grossly exaggerated or entirely false. I have not at any time believed otherwise than that L. Ron Hubbard was a fine and brilliant man. I make this statement of my own free will.” All the while, Gibney utterly ignored a lifetime of accomplishments that earned the Founder a place on Smithsonian Magazine list of the 100 most influential Americans. Still another lie involves Gibney’s so-called “clergy abuse” that started and ended in federal court before Gibney had filmed a single talking head. A federal court tossed out the claims as meritless and ordered the plaintiffs (who are also Gibney sources) to pay the Church over $40,000 in costs for bringing the frivolous action. A federal appeals court unanimously agreed, noting that they “enjoyed” their time in the Church. When the Church tried to call Gibney's attention to the plethora of errors that permeated the book he relied on, Gibney refused to even consider the Church’s concrete evidence detailing these serious material errors. Gibney based his film on Wright’s utterly duplicitous book Lawrence Wright that was so replete with falsehoods that leading British and Canadian publishers refused to print it. Wright, too, had based his book on the false claims of a handful of embittered former Church staff who were kicked out for malfeasance. Yet, when the Church tried to call Gibney's attention to the plethora of errors that permeated the book he relied on, Gibney refused to even consider the Church’s concrete evidence detailing these serious material errors. Instead, Gibney’s constant refrain was that he completely relied on his cohort and collaborator Wright, and that if it was in Wright's book, it was good enough for Gibney to use and repeat. While Gibney and Wright based the film on the book, they embellished it to further dramatize the story for TV and even contradicted it when it suited their narrative. 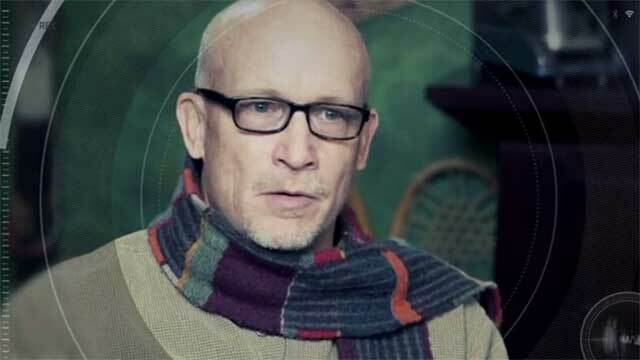 Wright’s purported protagonist, Paul Haggis, provided an entirely different story on how he joined Scientology and why he left the Church that completely contradicted Wright’s purported premise for writing the book. To make the film even more melodramatic and intellectually dishonest, Gibney relied on voiceovers that he supplied and extreme statements by non-percipient propagandists—Wright, Gibney and hate-blogger Tony Ortega—to make outrageous, inflated statements devoid of fact. Gibney’s HBO movie on the Church wasn’t the first time the integrity of his work has been questioned or criticized for being one-sided and misrepresenting the facts. His Mea Maxima Culpa: Silence in the House of God told the story of a Milwaukee priest who sexually abused young deaf boys under his care. Tragic as that story was, Gibney neglected to mention that long before his cameras rolled, the Catholic Church had removed the priest, made restitution to the victims, and worked to ensure such an incident would never repeat. A responsible filmmaker challenges his sources, presents many views and makes every effort to inform viewers so they can come to their own conclusions. Not Gibney. He works out his agenda, selects his targets and allows nothing to stand in the way of his preconceived spin. When the facts do not agree with his propaganda, he simply hides truth from the view of his audience. Gibney is a second-generation propagandist. His father, Frank Gibney, co-wrote The Penkovsky Papers, described in a 1976 U.S. Senate report that didn’t mince words as a “CIA book … prepared and written by witting Agency assets.” It purported to be the writings of Oleg Penkovsky, a colonel in Soviet military intelligence who was executed in 1963 after providing information to U.S. and British intelligence. The “witting Agency assets” were Frank Gibney and Peter Deriabin, a Soviet defector who had been an agent of SMERSH—Soviet military counterintelligence—and the KGB. Deriabin defected in 1954 and subsequently worked for the CIA for decades, collaborating on an earlier book with Gibney, The Secret World, and retiring from the agency in 1981. As a sign of Deriabin’s sensitive status, after he died in 1992, the CIA reportedly kept the names of his family members secret. But Deriabin and Gibney, the “journalist,” worked side-by-side on at least two books. Irresponsible work such as Gibney’s is not without its consequences. In Austin, Texas, on December 14, 2015, Erin McMurtry deliberately drove her car through the front door into the Church of Scientology at 9 p.m., narrowly missing two Church staff standing in reception, and continued into a room that earlier in the day was used as a nursery for parishioners’ children. McMurtry had watched Gibney’s HBO documentary on Scientology, as well as subjecting herself to other anti-Scientology propaganda. McMurtry was not alone. In Los Angeles, Andre Barkanov pleaded guilty to one felony count of making a criminal threat and one count of stalking after calling the Church, threatening to kill its leadership and “every single one of you.” According to police records, Barkanov told police he had “seen [Gibney’s] HBO movie” as well as hate speech by Leah Remini. 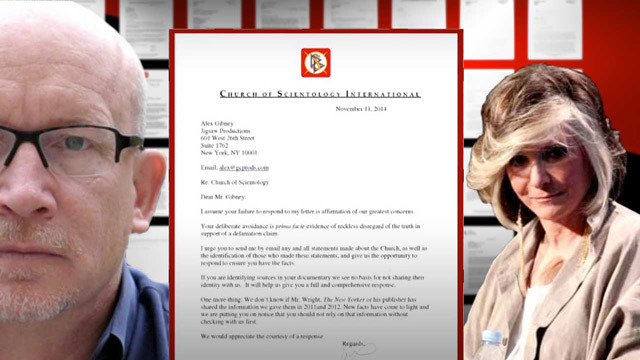 Refusing to interview 25 parishioners and Church executives who flew to New York specifically to meet with him, Gibney relied instead on a handful of sources expelled for unethical, illegal and criminal conduct as sources for his documentary on Scientology. 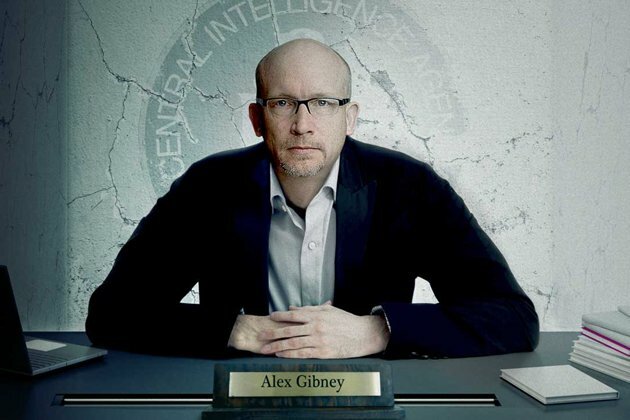 Gibney’s film on Scientology was based on a book which contained more than 200 factual errors, so many that leading British and Canadian publishers refused to even print it. In his documentary on the Catholic Church, Gibney used his sources to make false claims that smeared the entire system of Catholic clergy, intentionally omitting work by the church to make restitution and ensure the situation would never repeat.